Pay Consultation – Your Say Here…. Coventry City UNISON has received a message from Heather Wakefield, National Secretary of the Union’s Local Government Service Group, asking for your opinions about the national pay offer. A summary of the message is below..
‘The UNISON NJC Committee agreed last January to submit the NJC pay claim for 2018/19 earlier this year, to make our pay aspirations clear to the Local Government Association (LGA), whilst the negotiations on a revised NJC pay spine take place. The NJC pay spine review was spurred by the introduction of the National Living Wage (NLW) and the fact that around 200 councils have voluntarily adopted the Foundation Living Wage. – Context of pay claim: The sector faces the phasing out of revenue support grant and reliance on business rates; unprecedented cuts to funding; implementation of the National Living Wage; an ongoing pay spine review to maintain pay differentials. – The 5% increase on all NJC pay points is to reflect inflation and provide some catch-up on lost earnings. The deletion of pay points 6-9 after the 5% increase has been applied to ensure that no NJC pay points fall below the Foundation Living Wage rate of £8.45 per hour. – Pay at the bottom: Linked to legal minimum and remaining below the real Living Wage. NJC continues to be one of the lowest pay rates in the public sector. – Low pay: A problem throughout the pay spine with those above in the middle and top of the spine receiving scant reward and differentials being threatened following years of bottom loaded pay settlements. – Terms and conditions: Savaged across the board and impacting on pay. – Job losses: Employment in local government has fallen by over three quarters of a million since June 2010. – Recruitment and retention problems: Developing as value of pay plummets. – Inflation: RPI at 3.2% and CPI at 2.3%. RPI to average 3.5% over 2017 and remain over 3% to 2021. – Average earnings: Predicted to be 2.6% in 2017 rising to 3.6% by 2021. – Average pay settlements: 2% for private sector; 1% for public sector. Branches are asked to carry out as wide a consultation as possible on the contents of the proposed claim and return their results to your Regional Head of Local Government by 12 noon on Friday 26 May 2017. It is very important that the NJC Committee gets a view from as many branches as possible and that members are engaged at this stage in the claim. The UNISON NJC Committee will meet on 31 May 2017 to consider the results of the branch consultation and to agree UNISON’s proposals for the 2018/19 pay claim. In the meantime, GMB and Unite are also consulting their members on what they would like to see in the claim. The intention is for the Trade Union Side to agree the claim on Wednesday 14 June and to submit it to the Local Government Association (LGA) immediately afterwards. The LGA has indicated that they intend to consult councils over our claim and principles under-pinning possible pay spine models in June/July and respond to our claim in early autumn. It is likely that any pay offer will incorporate the new pay spine. Our claim and the pay spine review will both require funding beyond 1% and pose significant challenges to councils and schools under further economic siege by the Conservative government. – A major political campaign at local, regional and national levels to highlight the case for funding. – Draw up a campaign timetable to start after our claim is lodged to highlight the issues surrounding NJC pay and funding cuts in councils and schools Campaign details will follow’. Coventry City UNISON is therefore asking all our members on Local Government pay to complete a brief Survey Monkey questionnaire by following the link here. We will update you on the outcome of the pay consultation and further developments as soon as we receive further information. Is our pay claim affordable? Local government and school pay is now so poor that many workers have to rely on tax credits and benefits. It makes far more sense to pay this money as wages. I don’t agree with the pay offer – but why strike action? UNISON stands ready to enter further negotiations at any point, as do the other unions. However, the employers are in a very entrenched position and only strike action – or the threat of it – is likely to move them to make an improved offer. Will the strike make the employers change their mind? We certainly hope so and would not ballot ask members to strike if we didn’t think so. We are not a posturing or strike happy union —far from it. Strike action has always been a last resort in trying to force employers to negotiate more seriously. On the rare occasions that we have gone on strike across the local government sector in the past we have made gains on previous proposals. Although there is never a guarantee of all our demands being met, demonstrating the strength of feeling about our pay is vital. I can’t afford to strike. Money is so tight at the moment. UNISON understands your concerns. Council and school workers have already had to put up with a great deal. We are well aware there may be other very pressing difficulties you are being faced with right now on a local or personal level. But it’s important to think about what you could gain and the money you need in retirement to support yourself. the value of the pension pot accumulating is higher than it would otherwise be. The employers are relying on workers and unions being too weak and too scared to put up enough of a fight against this attack on your pay. We have to show them that they are wrong. If we aren’t able to make them re-think their stance, the employers and government will continue to cut your pay and conditions and we may never be in a position to recover the ground we have lost. Falling pay also means loss of pension, which could affect you for the rest of your life. Almost all effective industrial action is a breach of your contract of employment. However, UNISON has carried out a lawful statutory ballot. The law protects workers from dismissal whilst taking part in lawful industrial action at any time within 12 weeks of the start of action and depending on the circumstances; dismissal may also be unfair if it takes place later. My employer is saying that a one day strike would be seen as a break in service and that my continuity of service would be broken — is this true? During a strike your continuous employment is treated as ‘postponed’. This means that the period you were on strike for will not count towards your continuous employment, but it does not break the continuity of your period of employment. Do I have to strike? As a member of a democratic union we would hope that you would participate in a strike if there is a vote for strike action. You cannot be forced to do so, but it is part of belonging to a democratic union in which decisions are made collectively. We recognise that taking strike action is very serious, which is why UNISON asks you and every other member to observe the strike (if called.) Every member who does not undermines our bargaining power and makes it harder for us to protect all our members. Will I still have to strike if I voted ‘No’? If the majority of the people balloted vote ‘yes’ and a strike is called, we would hope you would join your trade union colleagues by participating fully in the industrial action, in line with UNISON’s democratic decision-making process. What should I do during a strike? Can I join a picket line? 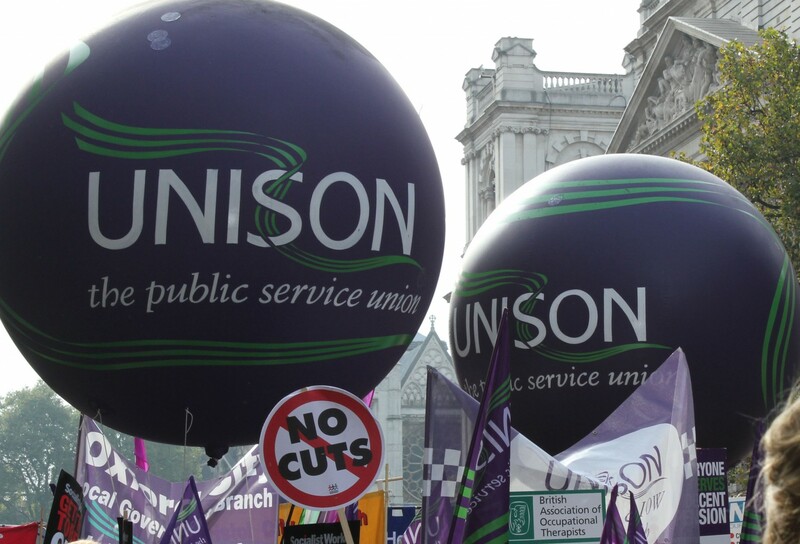 When UNISON calls a strike we ask that you do not go to work, but instead contact your local representative and volunteer to help out on the picket lines. This isn’t dangerous and it can be fun, as everyone shows that they are serious and united in taking action. Do I have to tell my employer if I am going on strike? No, if the day of action is confirmed in a ballot we will officially inform your employer and they should assume that all members will be striking. It is up to them to ask for any exemptions and to provide emergency cover (see questions on exemptions and emergency cover). Your employer might send you a formal sounding letter asking you to declare in advance whether you will be taking industrial action. You are under no obligation to inform your employer in advance as to whether you will be taking part in strike action. UNISON is legally required to give employers some statistical information about UNISON members taking industrial action but we do not give individual names. 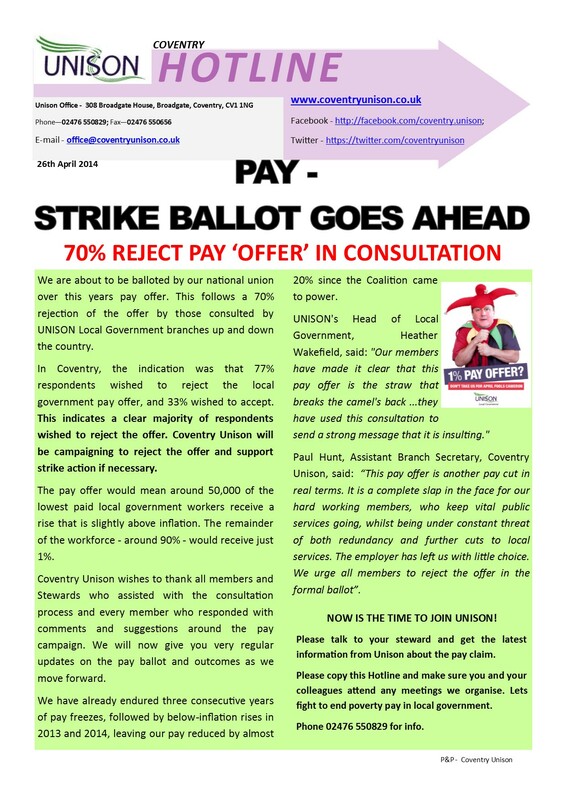 Will I receive strike pay for striking on 10 July? Strike pay will not be paid but the union will seek to help members experiencing hardship. Your branch will be able to advise you. I’m not a member yet – can I join now and still take part in the proposed action? New members can join UNISON, and join the strike (provided that their employer is one of the employers involved in the ballot), right up to and including on the day of action. So if this is the case, the answer is very much YES you can join the strike – you just need to fill in an application form first and hand it to your local steward. The biggest trade union representing workers at Coventry City Council has reacted angrily to news that the council recorded an underspend of over £7 million during the last financial year. ‘At a time when our members who provide vital public services are being told by the Council leadership that there will be more redundancies on the way and local services being cut, to hear that the Council underspent by £7.2 million is an act of injustice to our members and the people of this city. Money shouldn’t be put away for a rainy day when there is a deluge pouring down on us. Across the country council reserves have risen, surely this money should be used to defend services as demand for them continues to rise. It is sickening to think that our members are having to resort to strike action in an attempt to win a pay deal that would keep up with the cost of living, whilst money is stuffed away in the council coffers’. Planned industrial action will take place on 10th July. For details of the pay campaign and future events, visit the national Unison Campaign page via http://www.unison.org.uk/our-campaigns/unison-campaigns/worth-it/home/ or contact Coventry Unison via the above address or visit on the web via www.coventryunison.co.uk, our Facebook page at http://www.facebook.com/coventry.unison. I have lived in your constituency for (insert number of) years. I am writing to ask you to support UNISON’s campaign for a fair pay rise for local government and school support workers. UNISON is seeking an increase of at least £1 an hour for all the people like me who are keeping council services and schools running in the face of ongoing job and pay cuts. The final pay offer from the Local Government Association (LGA) would give the majority of staff a pay increase of only 1%. The pay of the lowest paid workers in local government is getting closer and closer to the National Minimum Wage, and hundreds of thousands of local government workers are paid below the Living Wage. Please lobby our council to get them to put pressure on the LGA to make a decent pay offer and on government to fund it. I do understand that our pay claim comes at a time of unprecedented cuts in local government funding by central government. But there are political choices that can be made. Since 2010 the local government pay bill has reduced by 25% and council reserves have increased to £19 billion. We are told that large reserves are needed for investment – some of this must be for investment in staff. If I had £1 an hour extra, I would spend it locally. This would give our local businesses a boost and help get the economy going too. Research undertaken for my union shows that if local government workers were paid an extra £1 an hour, the extra income from higher tax and national insurance ‘take’ and reduction in benefit costs would mean a saving of £760 million for government. If the Chancellor chose to do so, these savings could be re-cycled to councils to help pay for our claim. I’m sure you will agree that your local council and school support workers are doing a great job. But I feel that enough is enough, and that’s why I will be voting to take strike action. We have shown our commitment to keeping our local services going against the odds. I am now asking you to show your commitment to us. As you know, there are local and European elections this month. Councillors and MEPs will find it hard to get the support of local council and school support workers unless they do something now about the real hardship we face. Please help make our employers and government see that local government workers deserve better. – Public services are being closed or cut. As waiting times increase the quality of the service falls. These are the services we all use so its vital we fight to protect them! Does voting ‘YES’ mean we immediately go on strike..? No. A huge ‘YES’ vote will give our negotiators greater power to secure a fair and decent pay rise. Local government employers have treated our service area as the whipping boys for this governments austerity policies while slashing the services that working people and the most vulnerable require for a dignified existence. We need to use the right to strike if the employers continue to make us pay for financial crisis that local government workers had nothing to do with. Forcing our members into poverty is not the answer. The government says there is ‘no money’ to pay more than 1%. Why are they wrong? There is money for a pay rise, but the government chooses not to pay it. Councils across the country have increased their reserves to a staggering £19 billion and MP’s have just been awarded a pay increase of over 11%. A deficit busting £100 billion in tax remains ignored by the government which could stop the cuts programme in its tracks. Finally, the gap between the income of the top 10% and the bottom 10% has multiplied 14 times in the last 25 years. Still think there’s ‘no money’..? What can I do to help the campaign? -Firstly, ask any non-members to join UNISON. Secondly, get involved yourself! – Become a rep in your workplace—or help us get the message out that local government workers deserve a fair and decent pay rise for the hard work they do. Get in contact with us if you would like a chat about what’s involved. We are about to be balloted by our national union over this years pay offer. This follows a 70% rejection of the offer by those consulted by UNISON Local Government branches up and down the country. In Coventry, the indication was that 77% respondents wished to reject the local government pay offer, and 33% wished to accept. This indicates a clear majority of respondents wished to reject the offer. Coventry Unison will be campaigning to reject the offer and support strike action if necessary. The pay offer would mean around 50,000 of the lowest paid local government workers receive a rise that is slightly above inflation. The remainder of the workforce – around 90% – would receive just 1%. Coventry Unison wishes to thank all members and Stewards who assisted with the consultation process and every member who responded with comments and suggestions around the pay campaign. We will now give you very regular updates on the pay ballot and outcomes as we move forward. We have already endured three consecutive years of pay freezes, followed by below-inflation rises in 2013 and 2014, leaving our pay reduced by almost 20% since the Coalition came to power. Paul Hunt, Assistant Branch Secretary, Coventry Unison, said: “This pay offer is another pay cut in real terms. It is a complete slap in the face for our hard working members, who keep vital public services going, whilst being under constant threat of both redundancy and further cuts to local services. The employer has left us with little choice. We urge all members to reject the offer in the formal ballot”. NOW IS THE TIME TO JOIN UNISON! Please talk to your steward and get the latest information from Unison about the pay claim. Please copy this Hotline and make sure you and your colleagues attend any meetings we organise. Lets fight to end poverty pay in local government. Phone 02476 550829 for info. Following the series of consultative meetings organised by Unison, the indication is that 256 respondents wished to reject the local government pay offer, and 78 wished to accept. This indicates 77% wishing to reject, a clear majority of respondents. This information was fed back to the Regional and national union as part of the wider consultation process. Thanks to all those who attended the meetings and/or responded to my email on the issue. We will feed back further updates on the Pay Campaign as we receive them.